The next installment, El Gallo Mistico, the debut of a project led by the Cuban master percussionist Román Diaz that featured pianist David Virelles, continued the high caliber of musicianship and originality that seems to be characterizing this festival, whose program will juxtapose performances of Cuban, Argentinean, Brazilian and North American jazz artists. Between sets I spoke with Dita Sullivan, one of the most adventurous curators on the planet. I made Dita’s acquaintance last year, at the Jazz Standard, for part of her groundbreaking New Dimensions in Latin Jazz series, in which she’s been presenting the new wave of Latin American jazzistas in NY – many of whom would never have been seen in a jazz club if it were not for her. Here’s what she had to say about Jazz at the Crossroads. 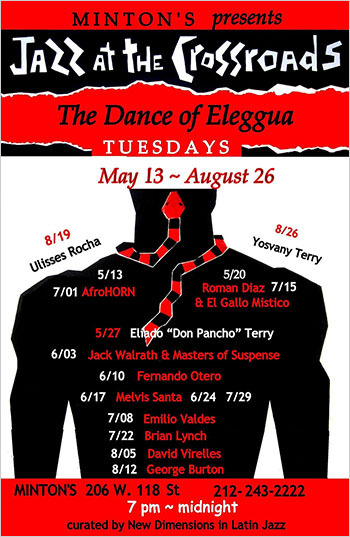 Tomas Pena: Congratulations on Jazz at the Crossroads – The Dance of Eleggua. It must be thrilling for you to present such an innovative series at this historic venue. 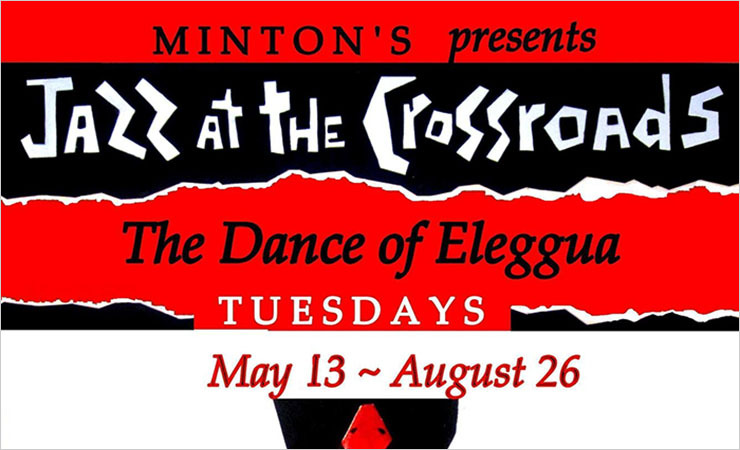 And Congratulations to Minton’s for giving you the artistic freedom to create and present this wonderful lineup. Dita Sullivan: Well, I’m responding in part to Minton’s itself, in this new incarnation, as conceived by Richard Parsons, the owner, and by Alexander Smalls, the executive chef and co-creator. Alexander – an artist in his own right, a former opera singer, and a great culinary innovator, has spent serious time in West Africa, cooking and exploring the culture. Out of that journey he has created a new cuisine that expresses the impact of the African diaspora on the world – from Asia to the Americas. So in the programming, I kind of had to step up to the plate – pun intended – and bring music that matched the sophistication and complexity of the food. It’s a miracle to have the opportunity to curate a music festival at Minton’s, not only because it’s a legendary club – the place where bebop was born – but also because of the way it has been restored. It’s an oasis of elegance: like jazz heaven, or maybe a movie about jazz. The room has the most perfect acoustics I’ve ever encountered – every place in it is a sweet spot. The title is intriguing and mysterious. Obviously there is more to it than meets the eye. Yes, you’re right. Thinking about the impact of intersections of those cultures brought to mind the Yoruban deity Eleggua, a child-like trickster who is the guardian of all crossroads and doorways; he rules the portal where past and future meet. Then I remembered that the club is on a corner – and I knew that I was on the right track. Eleggua is a key figure in the cosmology of pan-African culture in the New World: think of blues guitarist Robert Johnson at the crossroads; he didn’t sell his soul to the devil – he met Eleggua. Eleggua is also the embodiment of the multiple doorways onto the African-Caribbean-New Orleans-Chicago-New York musical diaspora that is a trajectory of jazz; a series of diasporas within each other, or leading into each other, with Harlem at the pinnacle. My mission in presenting Latin jazz has been to show that those experiences are connected by a current: one which is still not sufficiently acknowledged in official jazz history; the current of Afro-Caribbean-Latin music, which came out of the baroque, Creole culture of the Caribbean nexus that first flowered in New Orleans. Latin jazz is not a mere tributary of jazz, but the river itself, the very source of jazz in the first place. Thinking about that brought me, by a commodius vicus of recirculation, to the Eleggua-like forces that initiated me into the music – Mario Rivera, the Dominican multi-reed player-trumpeter-percussionist – aka “the musicians’ musician”, and Mario Bauzá, the Cuban clarinetist-saxophonist-trumpeter-composer and bandleader, creator of the first Afro-Cuban jazz band. And I realized that the two Marios were Eleggua figures, both to me and to the world: Mario Bauzá as the architect of Latin jazz – he is to the music what Frank Lloyd Wright is to buildings – and Mario Rivera as a prophet of the next generation. The festival is inspired by, and in honor of, them. Which makes the series all the more relevant and timely. How did you meet the two Marios? It was all quite by chance. I had just come back to New York from living in Louisiana, and my cousin Bob, a musician, took me to the Village Gate for Salsa Meets Jazz. On that first night, I saw Mario Rivera, playing, and in that instant my entire life changed direction. I got to know him by going to the Tuesday night Latin music shows at the midtown jazz loft, Soundscape, run by Verna Gillis, where the Gonzales brothers, Andy and Jerry, brought the music. That’s a story in and of itself, how the closing of Eddie Figueroa’s New-Rican Village impacted on Soundscape. To her credit, Verna Gillis called it “one of the greatest gifts anyone could have given her.” Speaking of Mario Rivera, his band – the Salsa Refugees – was one of two “house” bands that migrated to Soundscape. The other band was, Manny Oquendo & Conjunto Libre. Can you imagine? Every era has its venues – it’s the venues that make the era. Bebop might not have been born without those Monday nights at Minton’s in the ’40s. The midtown locations of the jazz clubs The Royal Roost and Birdland so close to the Palladium, where the great mambo orchestras played, facilitated interchange between American and Latin musicians in the ’40s and ’50s. Slugs on the Lower East Side, was where so much alternative free jazz blossomed in the ’60s. The Village Gate and Soundscape were the homes of Latin music meeting jazz in the 1980s – and also among the only places where the American and Latino audiences mixed. Because New York was a culturally segregated city then – the greatest thing about it was the Latin music, both as salsa and as jazz – but it was like a secret or forbidden world to most New Yorkers. Hispanophobia defined the mainstream attitude toward Latin culture then. I know from writing about it – I had to crawl across glass at the Village Voice every time I wanted to write about a major figure of Latin music, because the editor would have never heard of them. I couldn’t have made the cultural transition into that secret world without the Monday’s at the Gate and Tuesdays at Soundscape, and the countless nights-that-went-into-dawn at Mario Rivera’s apartment. His home was a constant jam session and place of study: a doorway onto a world not only of intoxicatingly beautiful music but of Afro-Hispanic-Caribbean culture. Under his guidance I went through that doorway and became a writer on music, a documentarian, and eventually a producer of live music. Rumor has it that there, were all sorts of instruments strewn about his apartment and that he could played all of them, fact or urban legend? Absolutely true, there were saxophones on stands, from soprano to baritone, flutes, trumpets, traps, tamboras, a piano. He played them all. Splendidly. But if you asked him how many instruments he played, he’d answer: “I’m still learning.” There was never a moment when some instrument wasn’t being played – unless he was eating or sleeping. I met him when I was writing an article about Rafael Cortijo, right after he had died; Mario was one of the musicians who spoke to me about him. At the time, I was one of the only English-language writers covering Latin music: I was writing for the Village Voice; that led to an invitation to go to Cuba for a music festival. When I got there, I discovered, to my surprise, that Bauzá and his work were largely unknown to the musicians in his native country. After returning from that first trip, I went to see him, to learn more about him. He was the most charming person I’ve ever met – and one of the most fascinating – he had done everything and he knew everything, and he talked about all of it with great eloquence. That became my school – going back and forth between the two Marios, in between trips to the Caribbean. Mario Bauzá loved to go out, and took me everywhere with him. Mario Rivera had the opposite personality – he almost never left home unless it was for work; everyone came to him. In one night at his apartment, you could be with Tania Maria and Hilton Ruiz and Giovanni Hidalgo and any one of number of American jazz musicians, and Dominican guys playing atabales – the indigenous drums of Hispaniola. The combinations and overlaps were endless. What the two Marios did have in common – aside from being great musicians – was that they were they both polymaths and fearless innovators – they loved traditional music, modern jazz, and the avant-garde and used all of it in their work. I wanted this festival to honor them by representing the diverse palate of what they did – and what they liked. Yes. A conventional way to do an homage is to have a big concert where the artist’s music is played, but what I wanted to do instead was offer concerts that were about them – in all their complexity – and that they would have wanted to go to. I was there. I’ve never seen anything like it. Words don’t do the performance justice but for those who missed it, it felt like an authentic Cuban rumba and North American jam session, rolled into one. It was a joyous, spontaneous performance that contained elements of Cuban folkloric music, progressive jazz, the spoken word, dance, chants and vocals with the masterful Román Diaz at its core. Yes – it is revolutionary – to have this thrilling AfroCuban ritual and music, so perfectly joined with the concept of progressive jazz as expressed by David Virelles on piano. Great Cuban musicians have understood, for almost a century, that the avant-garde and the folkloric are part of an eternal spiral – the concept is symbolized by the culebra, the serpent with its tail in its own mouth. El Gallo Mistico can be seen as a continuation of those modernist movements in Cuba of the 1920s and ’30s – the work of Guillen, Palaez, Cabrera, Garcia Caturla and Roldan – which embraced all the arts and extended to Paris and New York. Amadeo Roldán, one of the leaders in that movement, and one of the greatest Cuban composers, had the debut performance of percussion-driven symphonic piece, La Rembambaramba, here in New York in 1929. Don Pancho is a trip. Technically he’s an elder statesman but you wouldn’t know it by the way he moves. And of course, his sons Yosvany and Yunior are musicians, composers and bandleaders in their own right. Osmany Paredes is the icing on the cake. I had the privilege of presenting Don Pancho in 2010. It was an amazing concert and one that again, showed the continuity of roots music flowing into the new. He will be followed in June by the always-innovative post-bop trumpeter/composer Jack Walrath – who came out of the Mingus band. Jack was invited to symbolize Dizzy with whom Mario Bauzá collaborated – first by getting him a spot in Chick Webb’s band, and then by bringing him the Cuban percussionist Chano Pozo. Then in July, the Grammy-winning trumpeter Brian Lynch is coming. To me he represents Mario Bauzá himself as a trumpet player – I know him from when he was with Hector Lavoe’s band, back in the ’80s – but he’s best known for his work with Art Blakey, and of course, his seminal collaborations with Eddie Palmieri. Mario Bauzá loved songs, and vocalists – he discovered Ella Fitzgerald, and brought her to Chick Webb. As a bandleader he built his orchestra around vocalists, first Machito, and then Graciela. I was wondering how to present that dimension of his work, when I had the good fortune to find a marvelous young vocalist, also from Cuba – Melvis Santa. I’m giving her a debut and a residency in the festival. Bauzá’s work was all about joining Latin music and jazz – he was not only the trumpet player for Chick Webb, but the musical director as well – so to represent the drums and the cross-fertilization, I have the Cuban drummer Emilio Valdés in a project with the jazz guitarist Mark Whitfield. One of Mario’s favorite musicians and collaborators was the great Argentinean jazz pianist, Jorge Dalto – and he is represented here by his paisan – a brilliant pianist and composer – and Grammy winner – Fernando Otero. Mario Rivera’s reeds are represented, in the beginning of the festival by AfroHORN’s Sam Newsome on soprano and Alex Harding on baritone saxophone, and also at the end by alto saxophonist Yosvany Terry; Rivera’s groundbreaking work combining folklore with jazz in his Merengue Jazz project is represented by AfroHORN and El Gallo Mistico. 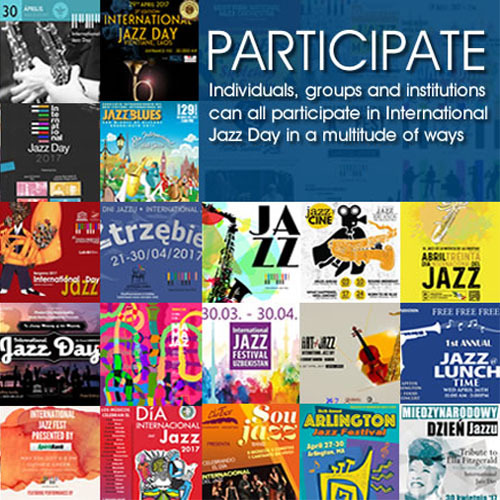 I invited two dynamic young jazz pianists to participate with their ensembles: George Burton – to represent the jazz piano of Don Kirkpatick, who was Chick Webb’s pianist and arranger during Mario’s tenure, and the divine Fletcher Henderson, with whom Mario also worked – and David Virelles, from Santiago de Cuba, to represent the great René Hernandez, from the Afro-Cubans. I love it when musicians ask me, “is it okay if I do something new? – my answer is always, “are you kidding? – Of course! – Four tubas and a cello – whatever you want – but at the same time, it’s a sad commentary on the state of jazz that the question needs to be asked. If an artist is good, he should be supported in whatever he wants to do and given the opportunity to do it. Isn’t that the whole point? Everyone involved in jazz is always complaining about how there’s not enough of an audience, and how, they need funding – like jazz is some kind of disease that needs a cure. But I don’t see the festivals offering enough variety or artists chosen for their quality and courageous innovations. Too often it’s the same name brands, doing the same thing, over and over again. My carte blanche approach to an artist I believe in is my antidote to all the fake, forced couplings – they could hardly be called collaborations – based on status, to generate publicity. That mentality is degrading the spirit of jazz. What I’ve been doing with New Dimensions in Latin Jazz is opening the door onto a renaissance of jazz that’s being created by musician-composers from Latin America; a movement in the city that has been consistently ignored, to the point of suppression. What tends to happen with the Latin American artists is that they are marginalized by the jazz establishment and treated like stepchildren, allowed into the jazz venues sporadically, like it’s a huge favor, but not acknowledged as the movement that they are. Then they are colonized/hijacked by American jazz musicians to provide background and credibility for so-called “Latin projects,” but ultimately that blocks them from doing their own work. I keep saying: “It must be a great thing to be Cuban, because so many people have an ‘AfroCuban project’ – but we hardly ever get to see the actual Cubans doing their own music.” It’s ironic, no? Actually, it’s a tragedy, for the artists, and for the audience – who, oddly, are much hipper than the people running the jazz festivals and most of the clubs. 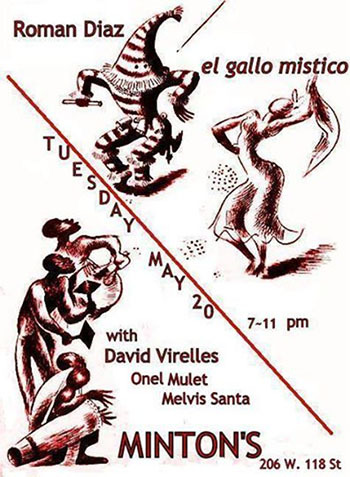 After the first set of El Gallo Mistico, I passed by a table of five or six people – regular Americans that you might see at any upscale jazz venue – and they were talking about how fascinating it was to see something so different and original. They got it. And Minton’s gets it – that’s why I believe that it will become the starship for the next era of jazz. Tell me how you really feel! The important thing is, Jazz at the Crossroads is giving Latin American musicians and composers the respect and the exposure they deserve. I urge everyone reading this to support Minton’s. You won’t see this kind of programming anywhere else. Good luck with the series. Thank you for speaking with me.